Service Type (1): This displays information for the current service/package level, from Business → Professional → Elite, that you are using for your WPX hosting account. How to subscribe/re-subscribe for PayPal payments in WPX Hosting? 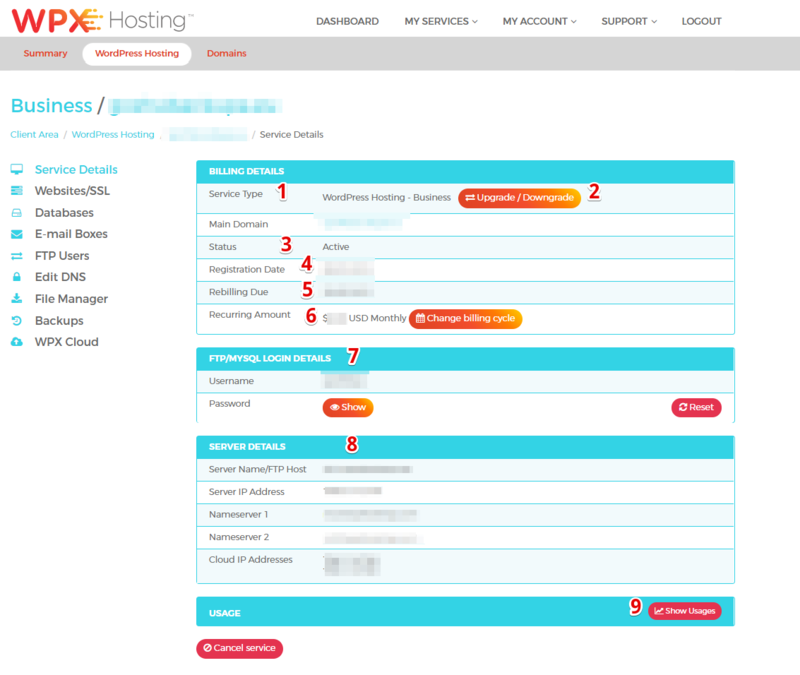 Status (3): Here you will see the current status of your hosting service, whether it is Active or Disabled. Registration Date (4): This displays the date of registration of your hosting service. Rebilling Due (5): Here is the due date for your next hosting service payment. Recurring Amount (6): This will display precicely how much is due each month or year, depending on your chosen billing cycle. FTP/MySQL Login Details (7): This is where you can find your FTP and MySQL login credentials. Server Details (8): Here you can find your Server Name/FTP Host, Server IP Address, and the Namservers in which your websites are currently hosted. Disk Space (9): The current disc space usage and limit for your account is displayed here. Current Month Bandwidth (10) The current bandwidth usage and limit for your account is also displayed here. You can also learn more about our WordPress hosting in Germany here (we also have a CDN end point in Frankfurt too). If you need more information about our hosting service in other countries, for example in France, click here. Details about our hosting in Australia are shown here. Information on your current account and also about our UK hosting could be found on our website (please read more). Read more about our WordPress hosting in Brazil. Discover WPX service in New Zealand. Learn more about us and our new CDN point in Amsterdam, Netherlands.